These discs, also known as French chocolate mendicants, make a great hostess gift. Instead of an elaborate dessert, why not serve these delicious treats with after-dinner coffee? Break 2 1/2 chocolate bars into pieces. Place in heatproof bowl set over saucepan of hot, not boiling water; stir until melted. Let cool slightly. Coarsely chop remaining chocolate; set aside. Drop melted chocolate by tablespoonfuls onto parchment paper-lined baking sheets; using back of spoon, spread to make 1 1/2-inch (4 cm) rounds. 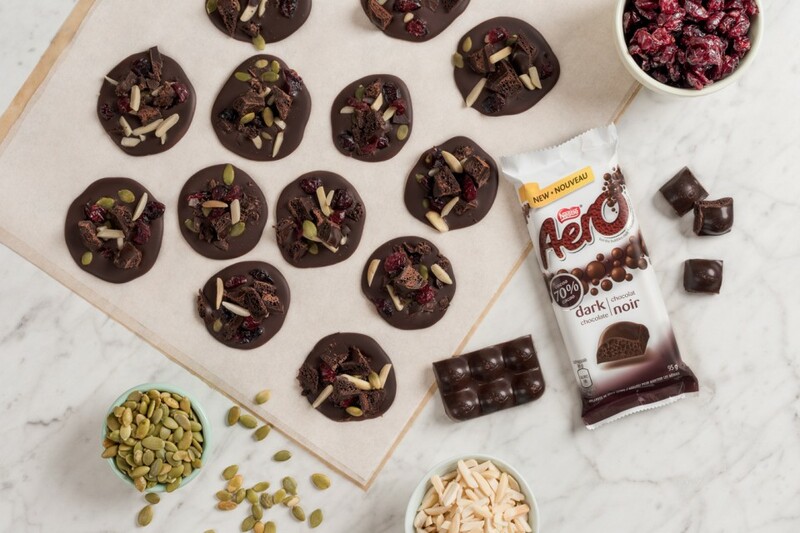 Sprinkle cranberries, almonds, pumpkin seeds and reserved chocolate onto each round. Try candied ginger or various dried fruit and nuts, such as raisins, sour cherries, dried apricots, hazelnuts and pistachios as toppings.